These are the invites I made for my friend Julie's baby shower that I hosted here on Saturday. I printed the card stock first then cut little fabric ovals, cut about a 1/4 of them out for the buggy shape and stitched them down to the card. Then I glued the buttons on for wheels. I received lots of rsvps that were accompanied by squeals over the invites, so I highly recommend the process should you find yourself hosting a baby shower...or an announcement would be charming too. Weird. I never managed to do anything at all clever when having babies, just long afterwards now for other people. I know lots of moms who both have the baby and correspond in ridiculously adorable ways regarding the baby. I never managed a knack for both at the same time. I have however given birth faster than I glued on all those buttons. That's a knack, I suppose. I sprinkled the house and patio with these "belly blossoms" before the guests arrived. I thought they evoked a sweet little in-womb view. The day also proved to be a perfect excuse to buy this gorgeous girl-pink hydrangea when I was at Whole Foods picking up dinner Friday night. Not that I need an excuse, but I'm just sayin' - there was a real reason to buy it. Which always feels good. Okay kids, back to work, more soon! 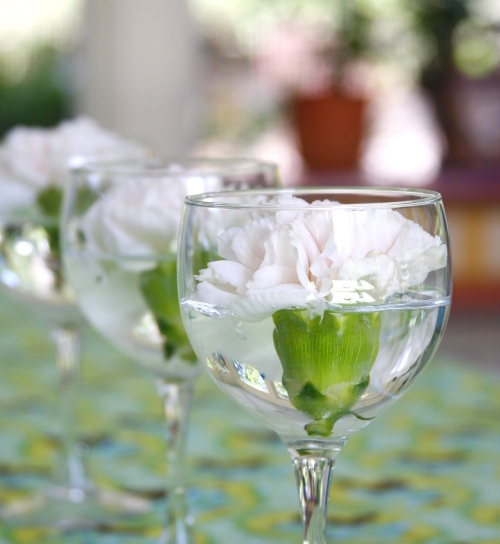 I love your idea of putting the blooms inside the glasses! And your invites were very, very cute! And very YOU! I'm not sure how others get so creative also when they are pregnant or have newborns! I spent all of my time focused just on them! I'm sure your friend greatly appreciated the party and I hope her delivery goes very easily! The pink hydrangea is gorgeous too... wow. Wow what adorable invitations and belly blossoms. That was so sweet and creative. Good grief. I think I just ovulated. You would think after 4 babies, I'd have more resistance, but just thinking of baby buggies and wombs and sweet anticipation... sigh. You made a lovely shower for your friend. I am sure there were more squeals of delight throughout the day. What a beautiful thing you did for your friend! You have such great talent and know how to use it. 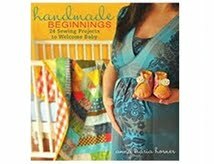 I will remember those baby buggy invites for future use:) I caught your interview on Craft Sanity, I loved it! ADORABLE! Lucky, lucky guests! And your photos are BEAUTIFUL - more, more! "I have however given birth faster than I glued on all those buttons." what a crazy thought! heh. everything looks absolutely gorgeous! very nice work on the shower! so precious! i love the invitations. i just started up an invitation business,..and i don't think mine are nearly as cute as yours are!!! love them,...and all the decor. it's so fun to decorate for cute parties, such as baby showers! thanks for sharing the pics....love them! What wonderfully whimsical invites! So cute! Those are too adorable. You did a great job! Oh my goodness, I love it all! So lovely. I need to find a friend who is having a baby so I can throw her a shower! your invitations are/were gorgeous and the flowers are lovely. what nice, creative ideas. i bet it was a wonderful shower with tons of atmosphere. OMG! I have filed those invites into my head. They are GREAT!!!! Those are darling. Not that you have the time at the moment but Parents Magazine is having some sort of "baby announcement" contest for an upcoming magazine (you can find details at their blog, i think it's called goody goody). Anyway, if you had time, you should totally enter these and win whatever it is you might win!! You get an "A" for "adorable" on those cards! that flower in the water glass is pretty cool! The shower invites are adorable! Your blog entries are such a pleasure to read. How do you find the time to take such beautiful photos, sculpt the words and look after 5 kids?! OMG!!! I LOVE THE INVITES!! cute cards! Julie is a lucky one to have a friend like you. 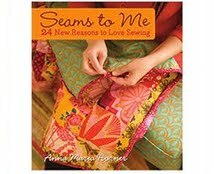 I love your blog and your fabrics too. Anna! these invites are so darling :) My husband and I are expecting (honeymoon baby practically!!) and after doing our own wedding invitations, this could be a really fun project for our baby announcements :) yay! Thank you for the inspiration. i love buttons too. and the little flower "belly" idea is darling too. I love the silliness and fun you can have with baby showers. I looooove the invites...I'm going to have to remember that. I did something similar for a baby announcement, though there was no stitching involved. These are lovely. I always eye those Whole Food hydrangeas too! What simple but darling invitations! I love the "belly blossoms"! What a great idea!! Oh, those are the sweetest little invitations I've ever seen! What a great idea! Ingenious cut. 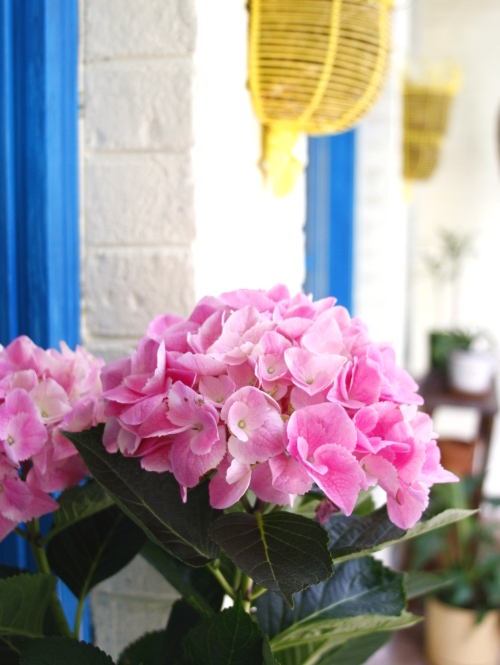 Though most of all I like your blue doors, yellow lantern and pink flowers. I have received my copy of ME's mag. I am so pleased you are getting that publicity! 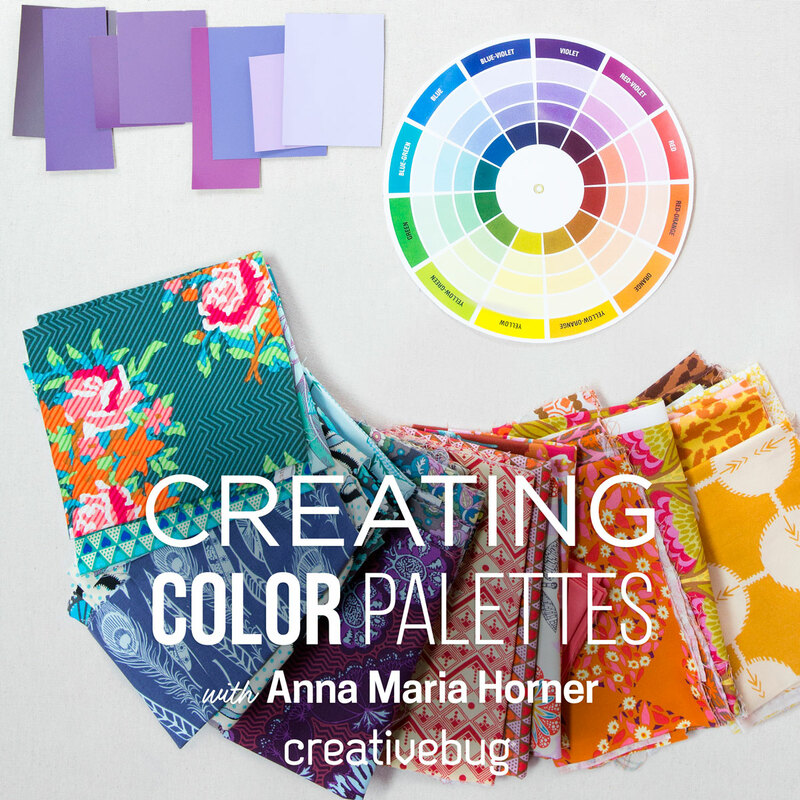 Thank you for brightening up my design trips! what clever ideas! i wish i had thought of this when i was throwing my sister's baby shower! always inspired coming to your website! These are amazing! You're a very talented person. Thank you for taking the time and sharing this with the rest of us. So, off the subject but I just got my Home Companion in the mail today. Your add is beautiful. Your daughter's dress is wonderful. Is it your photography? Okay AM, those are seriously cute!!! I squealed a bit myself. Thanks for the nice inspiration, I just may use that next time I'm planning a shower. those are a 10 on the squeal-ometer! what a good friend you are to do make these so special for her! love the flower in the glass idea! very clever! FYI...I just ran across a website that has Drawing Room for sale as of today - yay!!! 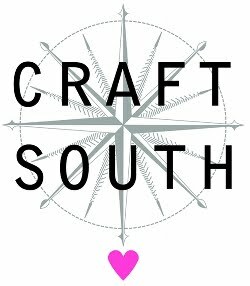 It's www.jcarolinecreative.com - happy shopping and sewing! Those invites are way too cute! I will definately have to remember that! Oh the invites are perfect! I just stumbled upon your blog. It is beautiful! Kudos to your for chasing your dreams. I adore those sweet invitations. I also wanted to let you know that I got a couple of bolts of Drawing Room in and I LOVE them. I have them up in my shop www.phatfabric.com and I plan to make some Pretty Ditty aprons out the beautiful fabric as well. You did an amazing job with the designs. Your Home Companion article is up - yay! Great story! Can't wait to see you next week. I am telling you right now, I am going to steal your invitation idea! See you soon clever girl. Oh how adorable! (And perfect timing this Mother's Day weekend!) Blessings to you this special day--thanks for mothering us all with your generous shares and YUMMY products and projects. I was looking at your flicker photos on Thursday and was inspired by your CRAZY 9 PATCH quilt to make one for my stepdaughter...cannot wait to finish it (top is done! go me!) Next are some aprons using CHOCOLATE LOLLIPOP I've been hoarding...and hen I want every stick of furniture recovered in the DRAWING ROOM LINE! How adorable are those invites?! Those cards are perfect. Brilliant! I am in LOVE with those invites!!! Dear Jesus, please prepare for me three daughter-in-laws just like Anna Maria? I'm over here in Ireland and baby showers are unheard of. and so naturally, there are no baby shower invites in the shops! But I'm planning one for my Irish friend (I'm American), so maybe I can reduplicate this? Any tips? I am totally inspired...we are having a tea party baby shower and I am going to sew cute tea cup invitations! Thanks for the sweet idea! The shower invites are just about the cutest things I've seen! Just lovely! The invitations are amazing! and a great way to incorporate your fabric! I can see from the pictures that everything was very thoughtful.very inspiring! Actions speak louder than words. Cindy McCain acted when faced with a need. And it says something good about John McCain's character that his wife could count on his agreement with her decision to act Laptop batteries. Oh my gosh! 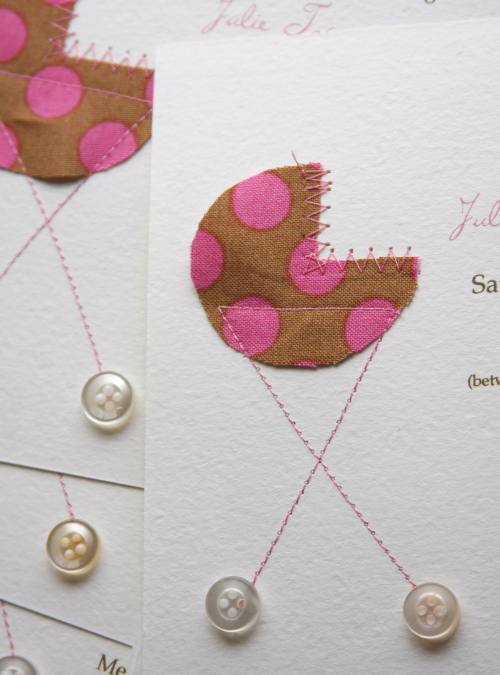 The baby buggy invitation is one of the cutest that I have seen. It is such a unique and precious invitation. Thanks for sharing! Who on earth are these people who have posted all this garbage on your beautiful site. You have taken the time and trouble to show us folks your fantastic baby shower creations and they litter your site with this. Sorry for the rant it just got my back up. Your creations are wonderful I love what you have done, your friend is very lucky. Hey, you have a great blog here! You really are very talented and deserve an honest compliment, congratulations. Your blog is absolutely one of my favorites. Love all the templates you find and all your own fabulous ideas. I will attempt to make them for an upcoming baby shower. I'll share a tip for attaching the buttons - use "ZOTS". 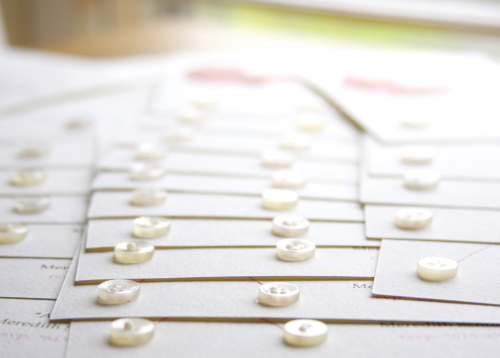 They are clear, adhesive dots which come in a small box. You can find them at most craft stores with the scrapbook adhesives. They save lots of time! I really enjoyed reading through this write-up. I most certainly will be coming back to read some more intriguing ideas. Thank you. These are adorable! I tried them with a cotton quilting fabric and they come out equally cute. Just make sure you iron them well when they are accordion folded. It is always something beautiful. This is truely a art. You always make it look so easy and so beautiful. Showers and flowers, so beautiful. This is some really nice art. We will share this with class. Notebook PC's laptop battery Okeru to accumulate the amount of electricity you are using more and more of the electric capacity has been reduced and degraded. Degradation seems to be somewhat suppressed ingenuity, people are using notebook PC will invite you to try. The metal laptop batteryconnections from 2 to wipe with a damp cloth every three months in an alcohol solvent. This will become more efficient power from a Compaq Presario CQ62 battery. No longer stand while charging the battery on laptop, at least two to three times a week should be used. Lithium ion batteries do not discharge it completely. Even though, PC's processing power rather than that of battery performance. Notebook PC will have to evolve, so things are getting better but the laptop batteryitself, rather than using those aged Damashidamashi forever, the new one's better. the HP Pavilion dv5 Battery have limited battery life. This lifespan rely on its use as well as its maintenance. For example, on average a 6-cell HP Mini 110 battery, can power up a laptop for 2 hours in a single charge. This single use can be elongated by power saving settings on the laptop such as lower screen brightness, turning off the Bluetooth when not in use etc. However, a rechargeable HP Pavilion dv6000 Battery can only be recharged for such use a limited number of times. After this time you will notice a sharp degradation in HP Pavilion dv4 Battery. life performance which will lead to significantly shorter periods of time in which you will be able to use our laptop computer on battery power. At such a time, the old laptop battery will need to be replaced with new HP Pavilion dv9000 Battery. Hi. I wanted to drop you a quick note to express my thanks. great site! I really love to visit this site. thanks to shear this.......…….